Disfrute de una bebida de su elección: Prosecco, vino tinto o una opción sin alcohol. Coma queso italiano como parte de su aperitivo mientras toca la música de la ópera. Fabulous, perfect setting, wonderful singers, not too long. The bar overlooking Rome where we had drinks afterwards was fantastic, what a view! We went in July, so it was very hot, you need to request a table in the shade. This was definitely one of my favorite experiences of Rome I will always remember. A small group in an elegant setting with a gorgeous view of Piazza Navona. 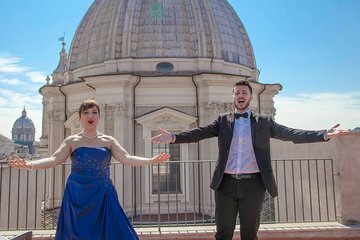 The two singers well expressed the passion and intensity of Italian opera. And of course everything goes better with wine and prosciutto. Even my daughter who is not an opera fan was very taken with this great sampling from the greatest IIalian opera composers. It was topped off with a visit to the rooftop bar with a beautiful 360 view of Rome resulting in some of my best pictures. Don't miss this taste of the musical essence of Roman culture! !